Ever wonder what it's like to be an ant in a rice field? If you visit this stunning illuminated pavilion at Expo 2012 in Yeosu, South Korea, you can find out. German design firms Atelier Brückner and Tamschick Media+Space have teamed up to produce Energy Field, a dramatic LED light installation that looks like an overgrown field of rice. The installation is part of the pavilion for GS Caltex, a Korean oil company, and it's meant to demonstrate the company's transition to clean energy technology. Each of the 380 blades in the Energy Field is 59 feet tall, and they tower over pedestrians and traffic on the adjacent street. The blades are made of artificial bamboo fiber, and they sway in the wind like living plants. 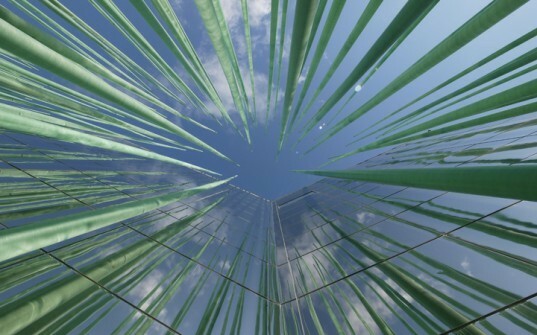 The reeds also react to their surroundings like living plants; the bamboo is activated by touch, and when people walk through the pavilion they can send out waves and flashes of light. Deep within the Energy Field, a star-shaped, mirrored pavilion is completely hidden from view, reflecting the LEDs around it. The lighting display shimmers and dances, at times resembling an elaborate fountain. Different settings are meant to simulate changing weather patterns. 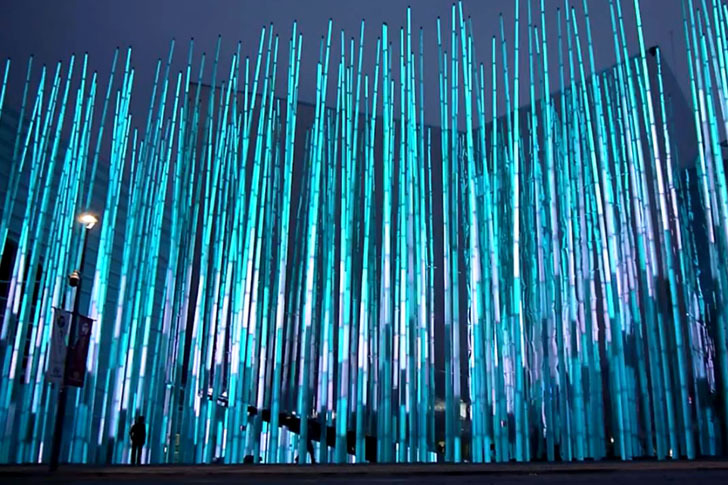 The project, currently on display at Expo 2012, is also billed as the world’s biggest walkable 3D matrix display (we don’t have any way to prove that, but it sounds nice). Deep within the Energy Field, a star-shaped, mirrored pavilion is completely hidden from view of the street, reflecting the LEDs around it. Each of the 380 blades in the Energy Field is 59 feet tall, towering over pedestrians and cars on the adjacent street. The pavilion, with its cave-like mirrored entrance, features a seven-metre-high round room with panoramic projection. The blades are made of artificial fiber bamboo, and they sway in the wind like living plants. And like living plants, the reeds react to their surroundings; the bamboo is activated by touch, and when people walk through they can send out waves and flashes of light. The lighting display shimmers and dances, at times resembling an elaborate fountain. Different settings are meant to simulate changing weather patterns.